With all of the excitement of Social Media and Digital Marketing, there have been a lot of articles and commentary lately about the demise of the 4P model. For those that don’t know or need a refresher, the 4P model stands for Product, Pricing, Placement, and Promotion. A good, simple overview of the 4P model is presented on the NetMBA site. Ogilvy and Mather published an article about the 4Ps being out and the 4Es being in. While I agree with the value of the 4E model as an extension or addition to the 4Ps (I have this as required reading in the undergraduate digital marketing course that I teach), it does not replace the 4P model. There have been numerous attempts to EXTEND the 4P model over time. There have also been arguments about what constitutes the main P’s with some arguing that People should be added (for customer segmentation). Some argue that the 4Ps have been replaced by the 7Cs. An alternative way of thinking about this is that the 4Ps approach the marketing mix from the vendor/producer viewpoint while the 7Cs approach marketing mix from the Customer/Consumer standpoint. I think that this is another model that goes deeper and is complimentary to the 4P model. As a way of highlighting the continuing importance of the 4P model, I point to the recent issues in the marketplace around Microsoft’s Surface RT tablet launch as a way of showing how critical the 4Ps really are to successful marketing. Regardless of your personal viewpoint (Pro or Con) regarding the Surface RT platform, the product has had a challenging launch and ramp by any objective measure and it can be clearly tracked back to three of the four P’s. From a Product standpoint, the Surface RT has had strong positive reviews for it’s industrial design but has also had negative responses to it’s lack of available apps and inability to run legacy Windows applications. From a Pricing standpoint, there has been strong pushback from reviewers on the initial pricing for the Surface RT. While there have been pros and cons about the Surface RT pricing and price positioning (with and without keyboards), the fact that it is raised as a value concern in various reviews shows that Pricing and price-positioning is an important part of the marketing mix. Finally, Placement has been a major issue as the product was initially available only in Microsoft’s stores and online. There was some commentary early on in the announcements that this was a point product for Microsoft and would not be available through broad distribution as a way to minimize competitive conflict with Windows 8 OEMS but that has proven to be an issue for the product’s acceptance in the marketplace. From a Promotion standpoint, Microsoft has done a good job of building Awareness. Using the 4P model it is possible to see clearly the challenges that they have in driving Consideration and, most importantly, Conversion. While there is always value in extending models and creating complimentary models, the claims that the 4Ps are irrelevant are questionable at best. Like good brands, good models stand the test of time. We’ve had endless debates internally about what customers want to do with our site and what works or doesn’t work with the layout of the pages. We have tried things that work in traditional marketing such as focus groups, surveys, analytics, etc. Unfortunately, what people tell you they WANT to do doesn’t always translate into what users REALLY do when they are on a site. One of our eminent advisory board members (thanks Wendy) spoke to us several months ago about the importance of tools such as heat maps to see what goes on with the site. We finally found a great tool that is beginning to expose real issues and opportunities in building a site that users will really use. 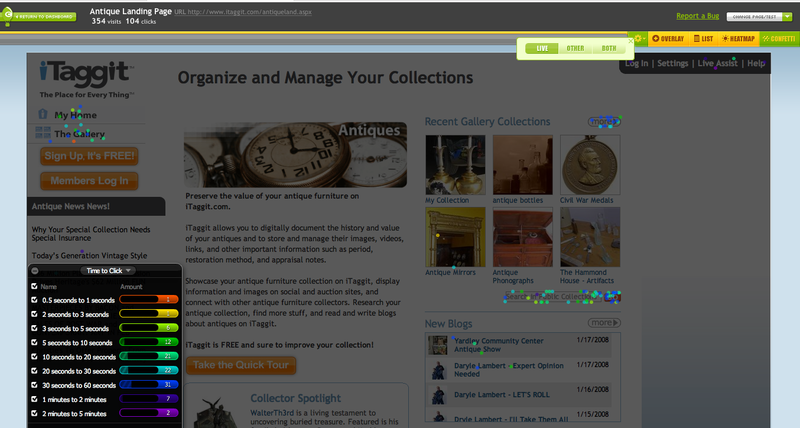 CrazyEgg (www.crazyegg.com) is a great tool that allows web site managers to visualize what users do when they visit your site. 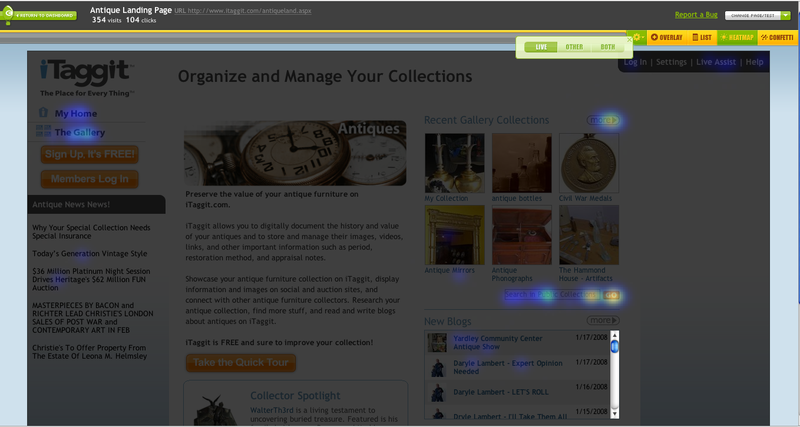 Heat maps tell you by color where clicks happen. Here is an example – this is a landing page for Antiques. What you’ll notice is that there is a tremendous amount of clicks on the search box and go button on the right, on The Gallery and My Home on the left, and nothing on the orange Take the Quick Tour button in the prime location in the middle! Obviously this is a page that we are going to redesign! Another great feature is called Confetti – which gives you detail by click about what users do. They show things like time to click, operating system, browser type, search term, and other important facts about user behavior and profiles. The best thing about CrazyEgg is the cost and the ease in implementing the tool. CrazyEgg starts at FREE and is priced based on need up to $49/mo. We are using one of the lower pricing tiers at iTaggit and it’s working great for us. The best part is that we can ramp up our pages and tests as we need to on demand. Implementing the tool is easy. It’s a line of code on the page that needs to be watched. It took us an hour to implement the tool and immediately started to see results. I’m not in the habit of trying to push someone else’s product, but this one is a great tool for any web marketer’s arsenal. Let me know if you find this tool useful. I’d also like to know if tips on tools like this is worthwhile too. Here’s a real challenge – what makes up the true acquisition cost for a customer in a user-generated content site? And what constitutes a ‘customer’? Since revenue on sites like ours is driven by advertising and affiliate product purchases a ‘customer’ can be either a registered user (who can contribute content) or a visitor (who just looks at the content). These are interesting metrics to track and trend, but they beg some real questions. How do we define an ACTIVE registered user vs. just a registered user? Does it matter? How do you factor in the value of items added as compared to number of registered users? Is one user that adds 200 unique/interesting items (which positively affects SEO and visits) more valuable than a user that adds 2 items (or none, but blogs)? Is there a way to segment registered users in a way to spend more efficiently to get the high value registered users? Is that a smarter spend than just driving activities to get visitors who may drive more purchases and ad views/actions? If you think about this question, it has important ramifications for most web 2.0 companies. I’d be interested in understanding how others approach this question. 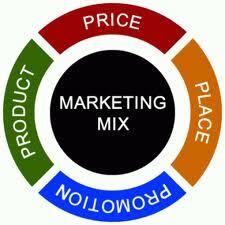 The traditional four P’s of marketing championed by Phil Kotler of Kellogg have been a cornerstone for many years. Product, Pricing, Placement, Promotion. At least TWO and maybe three of the P’s are much more difficult to manage given the changes driven by the internet and specifically Search Engine Optimization and Search Engine Marketing. Pricing is not as straightforward and direct as it is for traditional bricks and mortar (and even web 1.0) businesses. There are multiple levels to get to the paying customer. The revenue is much more indirect than in any other business. For example, if a web 2.0 site is dependent on advertising revenue how do you control the ‘P – Price’? Yes, once you get to a certain size you can demand higher CPA or CPC rates, but you are still dependent on generating traffic to show the ads and even then your ability to drive the conversion rates necessary to recognize the revenue is semi-passive at best. And this is AFTER you have reached a traffic level where you can even set a price at all. Is this truly ‘Pricing’ in the traditional sense? Instead of focusing on the traditional levers of COGS (cost of goods sold), Gross Margin targets, and variable sales and marketing costs the web 2.0 marketeer has to focus on traffic, eCPC (effective CPC) rates, Click through rates, and ad priorities. And where the site actually generates direct revenue (such as subscriptions or premium features) there are additional metrics and drivers that the marketeer needs to focus on that are far outside the realm of traditional marketing. Placement also has a very different meaning in the web 2.0 world. There is no shelf space (relatively) with the exception of search engine rankings and banner advertising locations. Banner ad locations also present a challenging difference. Does Banner Ad location represent Placement or Promotion? A/B testing is so critical in web 2.0 marketing! Unlike traditional advertising A/B testing where the marketing professional is testing both creative and media in the web 2.0 world the marketeer is testing location (placement) on page, media, specific site results, and creative. All of this with very questionable and inconsistent metrics between different sites and tools. So, what does this mean? In my mind we’re beginning to see a new paradigm develop. Marketing will be much more dependent on analysis of metrics such as click through rates, exit rates, and time on site. Rather than being able to run focus groups to find out what customers ‘want’ the web 2.0 marketeer is going to have to be able to do in-depth statistical analysis to understand how the customer ‘want’ is translated into actions and web development. Deepak Jain, the Dean of Kellogg’s School of Management, has a Masters in Mathematics and Statistics and is a top professor of marketing. I had a class with him early on and he spoke about the increasing integration of math and statistics into the marketing process. I didn’t get it at the time because I was in a traditional business. Now I do. He’s right and it’s moving faster than even he suggested. Are others finding similar things? I’d be interested in hearing your thoughts. We’re beginning to look for more quant-friendly marketing interns here. Are you? Mail me at daltounian@itaggit.com. There has been a recurrent question in discussions that I’ve had recently with potential investors, other web executives, and partners. That question is, ‘does an emerging tech company need to be in the Bay Area to have a chance of success?’? There are two sides to this issue; the first is that there are several advantages to being in Northern California. There is an abundance of funding sources out there and they all seem to prefer to invest in the area. There are also a great number of tech companies already established out there so the opportunity for partnerships may be easier due to location. Finally, because there is a rich business base in tech there is an incredible amount of services and resources that are competing for mind and dollars of the tech community (note SEO/SEM consulting firms – there are only a few in Texas so they are in high demand. In the Bay Area there are so many that they are fighting for clients). On the other hand there is also a tremendous amount of competition BY the tech firms for technical and marketing employees so wages are high and it appears that turnover may be a challenge there. The area also acts as a fairly ‘small town’ so secrets are not so easy to keep. For example, last week I was at a popular Woodside breakfast place and it was very telling to see who was meeting with whom. So… what does this mean for us at iTaggit? Well, over the next few months we are going to attempt to build a stronger corporate presence in the bay area while maintaining our base of operations in Austin. We have a fantastic, dynamic workforce and we need to develop the tech infrastructure for Web 2.0, 3.0, 25.0, etc. right here. We believe that we can combine the best of both environments to deliver a better solution for our users and a lower cost of operations for our investors. We’ll see how it goes and I’ll keep you updated as best that I can on my blog. A constant debate that I get asked about is the importance of research (planning) vs. action (activity). Some situations (and some people) demand significant planning and research before taking any action. There are also some situations that require action before all of the data and planning that would be desired can be completed. Here’s my rule of thumb – if time and/or competitive pressures are the critical factors then action is most important. Waiting to ‘think out’ a plan while the competition is taking your customers is not a smart thing to do. It would be much more useful to take some action – even if it’s preliminary. If the decision requires a significant investment or has long-term impact (like hiring people) then planning before action is important. You wouldn’t want to rush into making personnel or dollar commitments without fully understanding the consequences. So, what it comes down to is this – awareness and competitive response activities require timely actions – sometimes you just have to go for it. Activities that require large dollars, long-term commitments, and/or personnel moves require much more planning. Understanding when action is the priority and you can have a nimble, aggressive business. Acting when planning is called for may result in lost dollars, poor execution, and a confused business. Build a checklist for yourself that allows you to determine quickly which approach is correct.